“Pennsylvanian Gratitude," Harper's Weekly, July 11, 1863.
Credit: Harper's Weekly, July 11, 1863. 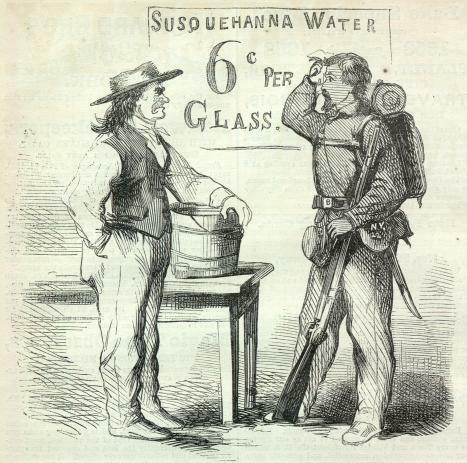 As Lee and his army advanced into Pennsylvania in June and early July of 1863 Harrisburg residents' price-gouging of out-of-state troops became a national scandal. In the Harrisburg Patriot & Union a reporter commenting "The Climax of Meanness" wrote that "There are men who would steal the archangel's trunmpet if his back was turned." In its July 11th edition, Harper's Weekly ran this editorial cartoon satirizing Harrisburg residents' exploitation of the troops that came to defend them from the Confederate invasion.